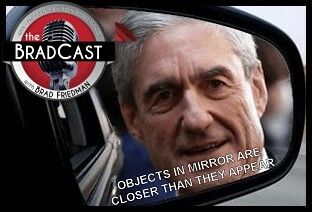 " How Mueller's 2016 Russian Cyberattack Charges Foretell Future Indictments Against Americans: 'BradCast' 7/17/2018	"
« PREVIOUS STORY "'Green News Report' - July 17, 2018"
"How Mueller's 2016 Russian Cyberattack Charges Foretell Future Indictments Against Americans: 'BradCast' 7/17/2018"
On July 16, 2018, Democracy Now! featured a debate between award-winning journalist Glenn Greenwald and president of the Ploughshares Fund, Joe Cirincione. Greenwald favored talks between the United States and Russia for lessening the likelihood of war; Cirincione disagreed, feeling that talks legitimated Russia authoritarianism, giving cover for its alleged actions in the US elections (while not denying, but in fact asserting, that us did that and worse elsewhere in affecting other nations' internal politics) and that Trump's ignorance of international relations leaves him open to being bested by a wily Putin and obtaining no kind of anti-nuclear weapon peace deal. For all its good qualities (It is Democracy Now!, of course) the debate, I would argue, misses the point. The talks were not in pursuit of some species of mutual coexistence between two rival nations, an opening act toward nuclear disarmament. After the Soviet break-up Russia is no longer a communist country. It now has a capitalist economy, one that sustains a wide gap between the rich and everyone else (just like the USA). As a model it more resembles the authoritarian Latin American nations that the US supported in the 1980s. It is quite clear that Russian President Vladimir Putin's power is based on what we can call a parliamentary-oligarchic autocracy. Russia's efforts to destabilize the western democracies is not due to a hostility to democracy per se in other nations, as is claimed in the American corporate media. Rather, it is that those nations' membership in NATO makes them a threat to Russia and its interests. Indeed, Russia’s current support for reactionary forces in the western nations is based on a calculation that reaction in those nations will lessen the threat those nations pose as an anti-Russian alliance. This is because reaction would be act as a shared value between them and Russia and serve as the acid to dissolve any alliance borne of any interest to either protect or promote liberal democracy or act as a check on nationalism and its handmaiden, military belligerence. Since the end of the Cold War the United States has pursued the expansion of NATO membership, pushing its boundaries practically up to the Russians' front door, if you will, in the face of Russian objections. This is after many "assurances" by the U.S. not to seek NATO expansion. Answer: the project for both US and Russia is not mutual coexistence between two rivalrous but powerful nations. No. The project is the formation of a new rightist axis alliance. Putin and Trump are not interested in peaceful relations. Rather, they are interested in forming a new alliance based upon a shared vision of reactionary politics. In Russia we have an oligarchic-parliamentary-autocracy while in the US we have an alt-right-friendly executive branch with nostalgic dreams of a pre-Lochner, pre-Civil Rights, pre-women's liberation movement America, sustained by a legislature whose majority is openly hostile to domestic democracy and shows it by supporting efforts that make electoral democracy ever more out of reach with voter-suppression schemes, etc. Don't even get me started on the US Supreme Court. Does anyone really believe that the character of any "negotiations" between Trump and Putin is in the pursuit of lessening tensions for the long-term goal of keeping and extending whatever peace there is between their nations? Or can one see that the real goal in such talks is the mutual project of right wing politics, with each nation in pursuit of its specific domestic bigotries, weaponized against their own respective populations? The real historic tension that the US has always had with Russia is that Russia can, if it wished, act as a rival interest in its own immediate neighborhood (like, say, Iran can), and it can even act as a restraint on American imperial designs in the parts of the world where Russia may still have influence or interests. This capacity was present during the Cold War and although Russia is now a weaker nation, it still has that capacity to check American designs. And that is the REAL reason you see so much bipartisan finger-waving-at-Trump-rage in the corporate press. What mainstream TV liberals (with the notable exception of Chris Hayes) and TV conservatives share is a deep-seated misconception of American power in the world as fundamentally benign, and that its overall project is the protection and promotion of democracy abroad and at home. Needless to say, the historical record shows otherwise. Neo-Cold-War-ism in the establishment liberal community, joining hands with embarrassed conservatives who haven't forgiven Russia for having been communist - which it had ended 'way back in 1989 - is a spectacle that is only possible if we ignore the rightist domestic agendas of BOTH nations. If the US had a true small-d democrat in the White House, one that was truly committed to peace, then talks with Russia would clearly make sense within the context of lessening international tensions. But we have Trump - a man who does not have a peaceful bone in his body and had lied about his opposition to Bush II's war in Iraq. Peace is not his agenda - he moved the US embassy in Israel from Tel Aviv to Jerusalem for f*ck's sake! How much peace did we get out of that? So, what could his agenda possibly be with Russia, if we were to at least humor the notion that peace may indeed not be it, his claims to the contrary notwithstanding? Let us repeat from earlier: the US has encouraged new members into NATO, causing its frontiers to close in on Russia. That is pretty imperialist, if you ask me. If America being the foremost model of domestic democracy and the benign nature of American hegemony abroad were not both held as foundational beliefs by the American political class, beliefs that are sustained and promoted by the American corporate media's news and entertainment outlets, the American people would have an opportunity to expand the questioning of Trump's actions beyond the prospect of either his being "bought" or his fearing the release of a pee-pee tape. On July 16, 2018, Democracy Now! featured a debate between award-winning journalist Glenn Greenwald and president of the Ploughshares Fund, Joe Cirincione. Greenwald favored talks between the United States and Russia for lessening the likelihood of war; Cirincione disagreed, feeling that talks legitimated Russia authoritarianism, giving cover for its alleged actions in the US elections (while not denying, but in fact asserting, that the US did that and worse elsewhere in affecting other nations' internal politics) and that Trump's ignorance of international relations leaves him open to being bested by a wily Putin and obtaining no kind of anti-nuclear weapon peace deal. NO. Mueller has thrown every major investigation he has ever been on. Mueller is a special special counsel. He is containing and covering up the truth. Look at his entire career, especially with Tom Thurman at the FBI crime lab.